all about budcozy: ipod & iphone earbud accessory. Plus thoughts on design, ideas, art and the eco-friendly. My friend Josephine Thompson works with Dr. Richard Hansen and over 340 archeologists and tradesperson who are dedicated to permanently preserving the Mirador Basin. Dr. Hansen has made it his life's work and has been at it for 30 years. Josie started a Facebook group to raise awareness and hopefully come to some collective decisions about how to create a truly sustainable model for energy, communications and tourism. 1) How are we going to change this from an archaeology camp of 340 workers, using 5 generators, to a sustainable energy project? 2) Our satellite dish does not use a fast uplink/downlink and everyone who is stuck in the jungle for 5+ months cannot use video conferencing, IM or Skype. How can we get more bandwidth and add a communication network to a region that is completely off the grid now? 3) Please send links to examples of the best ecolodges in the world and express your opinion. If you are a member of Facebook, please VISIT and JOIN the group to learn more and to offer advice and support. If you are not a member of Facebook but would like to be involved you can contact me directly. I came across this article about one person's experience hiking to Mirador. This is definitely a trip I have to psyc myself up for. 3 day hike in the jungle with heat, humidity, spiders, deadly snakes, ticks, jaguars, poisonous plants, oh my. Josie, are you sure I can handle it? 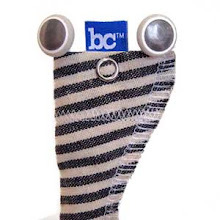 Budcozy™ is a locally crafted & eco-friendly accessory that keeps your iPod & iPhone earbuds tangle-free.